Croatia’s economy is entering another year of recession in 2013. Given the need to consolidate public finances, a rapid recovery cannot be expected. Speeding up the stalling reform process be- comes increasingly difficult due to high and persistent unemployment. 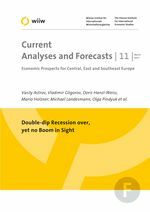 Joining the EU in July 2013 may help to boost foreign investors’ confidence, but positive effects from EU membership may be expected only in the medium term.